Our first frost technically came early Thursday morning, when a thin skin of frozen dew formed on top of the woodshed roof. Luckily, it only hit 34 at garden level, so I gained an extra couple of days to get things done. 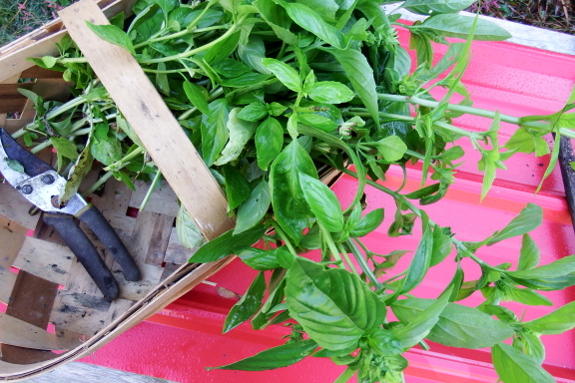 I was glad that I'd picked the best of the basil to dry Wednesday, though, since this tender herb tends to get nipped around 40 Fahrenheit. When I thought we were going to get an ultra-early frost at the end of August, I was scurrying like crazy to cover things up. But our average first-frost date is now gone by, and I'm actually ready for the summer veggies to perish (and the cabbage worms along with them). So rather than covering things like peppers and tomatoes, we just picked the plants hard, planning to move on to fall edibles once the freeze makes the summer garden a thing of the past. That said, I did cover our youngest lettuce bed. No need for a freeze to set back one of our most dependable autumn vegetables! Maybe I'll even break down and light Huckleberry a fire? I still have peppers coming in and since I hate green peppers (they're NOT ripe! and taste like grass) I usually cover them with plastic making a type of "greenhouse". This way they can still ripen and I sometimes can keep the plant viable up until Thanksgiving. Ha! I was doing exactly the same thing today... mad scramble to pick anything left, and quick hoops to cover the autumn edibles.... i am having a bit of a space crunch in the frig though... the cellar isnt quite cold enough for storing yet. What to do with 40 MORE pounds of carrots and pounds of chard, and a five gallon bucket overflowing with celery? 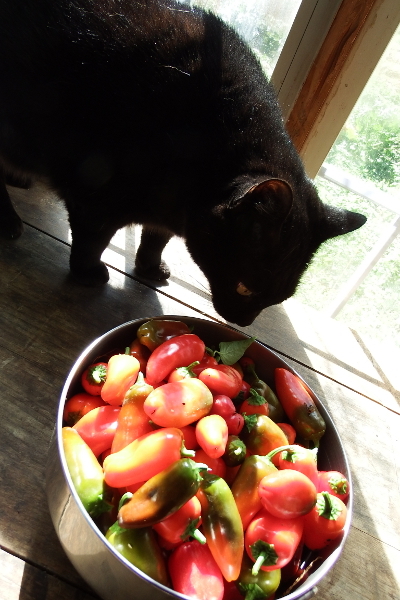 And speaking of green peppers, we cut into one of the green ones i had picked for supper, and I think the bell must have cross pollinated with one of the hot peppers-it had a bite!